The heritage of Pickens County and those who populated it through the years is rich with Cherokee Indian lore, the saga of the Georgia land lottery, and Civil War depredations … but perhaps the most compelling histories of this area revolve around the very large deposit of exceptionally pure marble found beneath the soil! The first quarries were established in the 1830’s and are even now a major industry in the county. Pickens County marble has been used in the construction of many notable buildings, such as the Lincoln Memorial and the East Wing of the National Gallery of Art in Washington, DC. Pickens County is a fascinating part of North Georgia history, from the late 1700’s when it was home to Cherokee families until current times as the marble industry plays a significant part in lives of the local people. 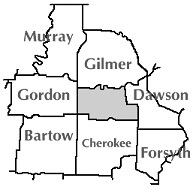 It evolved from Cherokee Nation to Cherokee County, Georgia — and then Gilmer County, until the official creation of Pickens County on December 5, 1853. In genealogical research, we discover so frequently that our related families slip back and forth across county lines from generation to generation. Coupled with the fact that county boundaries shift, this makes research challenging! To make your search easier, we have included here links to the GAGenWeb sites of the neighboring counties. The GAGenWeb’s parent project, the USGenWeb Project, consists of a group of volunteers working together to provide Internet websites for genealogical research in every county and every state of the United States. The Project is non-commercial and fully committed to free access for everyone. Organization is by county and state, and this website provides you with links to all the state websites which, in turn, provide gateways to the counties. The USGenWeb Project also sponsors important Special Projects at the national level and this website provides an entry point to all of those pages, as well. The GAGenWeb Project is dedicated to the free exchange of genealogical information on the World Wide Web. Our goal is to provide free genealogical information for the family researcher in a manner that will protect the privacy of living persons by not sharing personal information about them without their permission. This is the official website of Pickens County’s representation in the GAGenWeb project. You’re invited to participate in the GAPICKEN MailList.